What is the oldest piece of furniture you have in your home? Was it an antique handed down by your family? What about items that were built in your backyard? 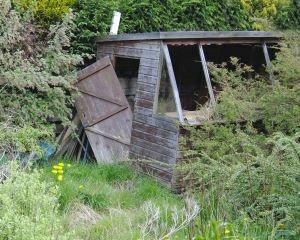 Is there an old swing set, tree fort or garden shed that has seen better days? You definitely don’t want to wait until those things collapse under the weight of a storm. Instead, if you need something like a backyard shed taken down fast, then there’s only one call to make: Junk King Indianapolis. Most homeowners who call in Junk King Indianapolis rely on their friendly teams to lift and load furniture and appliances. Those are two men job that are easily handled by the Junk King team. But when it comes to taking things apart in order to fit it onto the truck, you’ll find that Junk King Indianapolis is just as adept at that type of task. The crew will show up with their own tools and experience in order to bring down just about anything you want taken apart from your backyard. All the pieces from your backyard shed will be loaded onto the Junk King truck. Before that actually happens, the crew will present you with an estimate based upon the amount of space your junk will fill up on the back of the truck. Since they have been doing this for a long time they are experts at packing a lot into a very limited amount of space. That means you are going to benefit from the low end of the price range every time. Before they finalize that estimate, you may want to show them some of the things you want to get rid of. Remember, the crew is going to do all the work for you. They don’t mind carrying stuff down from the attic or up from the basement. And since weight is never an issue, you should limit yourself to what you want to get rid of. The other benefit of working with Junk King Indianapolis is how they handle the disposal of all the things they collect. Those pieces from your backyard shed might be able to get recycled. Wood can be grounded up into mulch. As for the things around your house, they might be in good enough shape to be donated attic area charities. The best approach to backyard shed removal and junk hauling is working with Junk King Indianapolis from the start. This entry was posted in Indianapolis Junk Removal and tagged backyard shed removal, clutter, rubbish on August 31, 2017 by Junk King. Last updated August 31, 2017 .